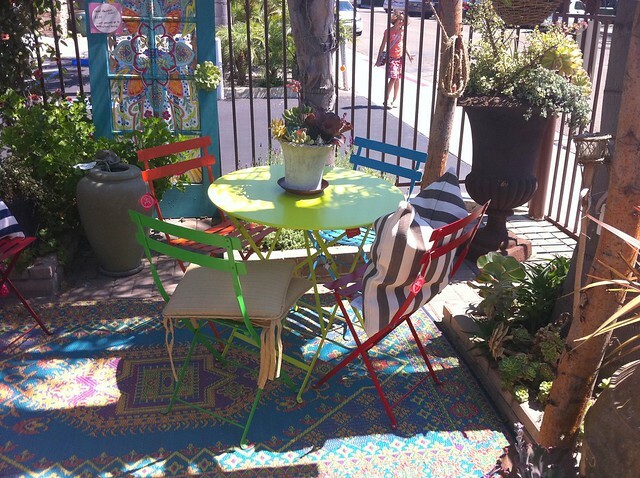 While shopping in the Cedros Design District in Solana Beach, we came across a boutique that was a little different. Here’s the rest of it. The space was so small I couldn’t back up to shoot all of it. I did want to show the beautiful detail too. There were also colorful bistro sets. . . . I almost felt like I was in Provence. The light and climate are very similar to Southern California. That’s probably why I like it so much. Hope your weekend went well! 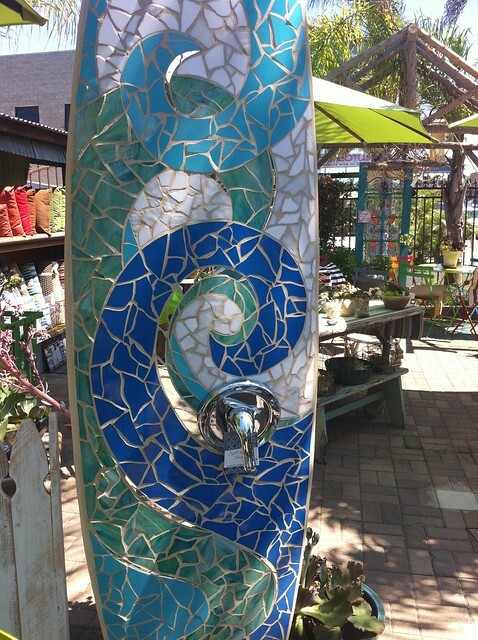 This entry was posted in photography and tagged bistro set, California, Cedros Design District, mosaic surfboard shower, sea glass, Solana Beach, succulent arrangement. Bookmark the permalink. Very original. A great outdoor shower. But I like the succulent arrangement as well. All the succulents were arranged so beautifully. There was one that was incredible, but the light was terrible. I’ll have to go back. Love the surfboard shower – one of the most original and attractive ideas I have seen lately! Me too. Have never seen anything like it! LOL…you have to love California! I know, right?? Where else would you see a shower like this? Sure beats the shower we had at Laguna when I was a kid. Just a shower head and a string to turn it on. My mom was obsessive about not getting sand in her car after beach days. Obsessive! But hey, I got to go to the beach a few times a week every summer for my first 13 years. Not a bad childhood! And I also went to Disneyland a lot. A neighbor worked there and would give us free coupons. Oh, I am envious now. Living in the Midwest, going to Disneyland was something I could only dream about. When I got to go at the age of 10 it was the best day of my childhood. Hands down. Last night we were out to dinner with friends and saw a young girl get into a very nice Mercedes with sand all over her legs. Wet sand. Had to cringe. 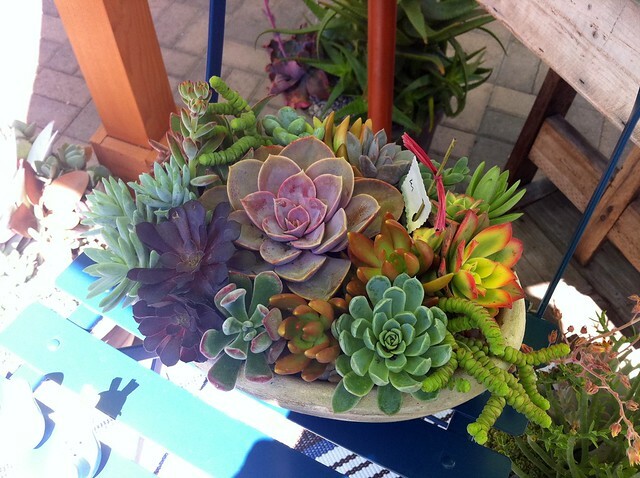 That succulent arrangement almost looks good enough to eat! I love that shower too. The store should let you “try it before you buy it.’ Ha! Great array of shots, Carole. I love it when you share these tours of the quaint and unusual. I do mosaics when I need to claw a little order back into my artsy – not the product, but the process. 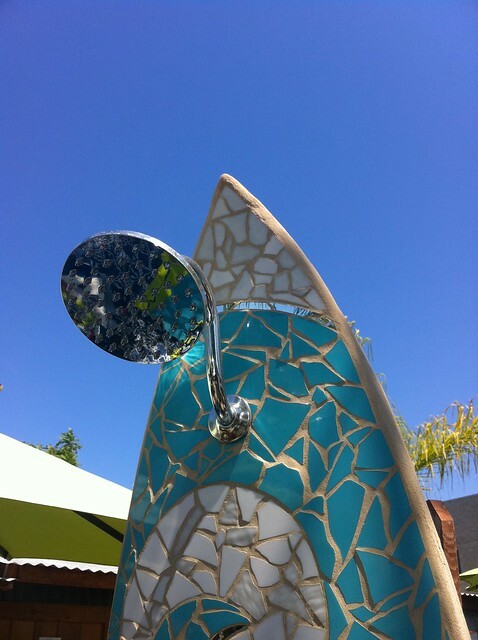 Don’t think I’d ever tackle a surfboard shower, but it is COOL! Thanks, Cheryl! Mosaic is something I’ve never tried, but would like to one day.